I arrive at Number One Observatory Circle, the residence of the vice-president, where I am escorted into a dining room by a buttoned-up fellow whose valiant attempts at professional detachment cannot conceal his hatred of the job. He doesn't want to be here, and neither do I, but when the vice-president inexplicably invites you to dinner, you go, if for no other reason than morbid curiosity. I am seated at a table impressively appointed with formal settings undoubtedly selected by the wife of some long-gone executive second. The glasses are cut crystal, the edges of the pattern as sharp as the vice-president's features. While I am left waiting, I go over the words I have been preparing for weeks. The things I want to say to my former governor and possibly future president. I scroll through the list of indignities he wrought upon Hoosiers, the people he harmed — this one man, who has affected so many lives; who has been elevated to affect even more. I go through my list of questions, the various accountabilities I will seek when he arrives. The demands I will make, as gently as possible, over whatever suitably Midwestern food we are served. I imagine him trying to charm me away from my determined charge by telling me the corn is from Indiana. The longer am I left with my thoughts, as he takes his time to arrive, the more doubt creeps in. It's not myself I doubt; I am shy by nature but equally tenacious. It's him. I have continually banished the insistent thought that he has not invited me to listen, but to lecture. He does not want to be persuaded, but to convince me. I cannot hold this thought at bay any longer. I have not been invited as a guest, but as an adversary. And suddenly I am overwhelmed with the feeling that there is no point to this meeting. Not for me. I see the entire evening laying itself out before me, and it will be no different than a million interactions with common online trolls. No matter how much good faith I extend, it will be abused. He will lie. He will tell me lie after lie, weaving in between each dishonest phrase reminders of his moral superiority, his mendacity and sanctimony twisting into a blanket that threatens to smother me. He will say things that are demonstrably false, and reject out of hand any attempt to acknowledge the truth. Because this is who he is. The King Cobra of all conservative snakes. A myth-teller and fantasy-spinner, who conjures tales of imminent threats and the strawpeople who pose them. There is no conversation to be had here, and not because I don't want one. Because he doesn't. 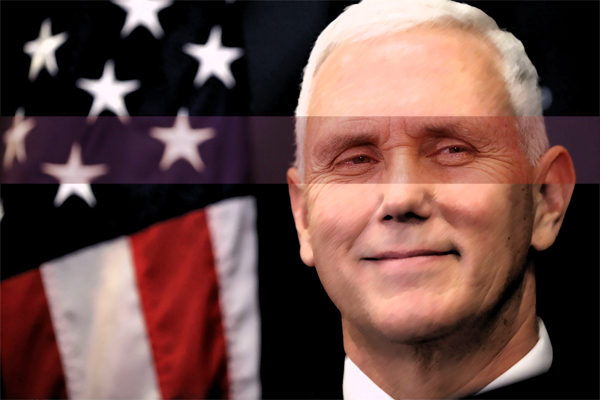 It does not matter that he is the vice-president of the United States. My appetite — for the meal, and for whatever would accompany it — is gone. I stand to leave just as Mike Pence enters the room. Naturally, he is accompanied by his wife, as he is never alone with a woman other than her. He introduces her to me as "Mother," and extends his hand to me in greeting. I do not take it. I look at his face, holding his gaze in silence. He is smiling — at least, his face has done all the things that faces do when a person smiles: His lips curl up at the edges, his skin creases, his teeth bare slightly. But there is no mirth in his eyes. They are icy and cruel. I tell him I cannot join him for dinner after all. I wait for him to ask me why, but he holds his fixed expression; his eyes flicker with something he struggles to contain. So I volunteer. I tell him that I have already spent far too much of my time and energy with men who don't want to listen, and I haven't a moment more to spare. Before I turn to leave, I ask him if he will please have whatever food was prepared for us sent to a local shelter. He promises at my back that he will. And it is the only lie that I am obliged to hear.